Over the months, I’ve developed a nice color scheme for Jeopardy! tournaments. As with regular winners, quarterfinal winners are marked with green, like an optimal wager; wild cards get orange, usually reserved for acceptable alternative wagers. In my mind, an orange wager is as good as a green wager. Is the same true for the strengths of the two flavors of semifinalists? 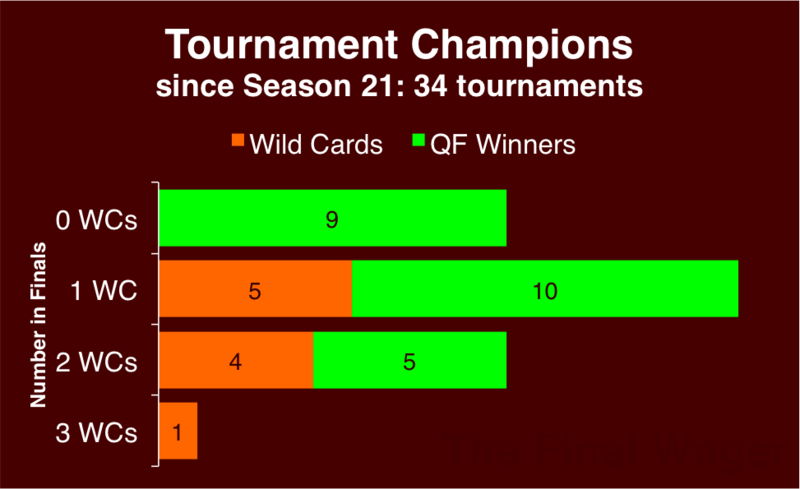 Assuming each semifinalist is evenly matched, we should expect wild cards to win 4 out of every 9 tournaments, or around 15 of the 34 that have taken place since Season 21. They’ve won only 10. 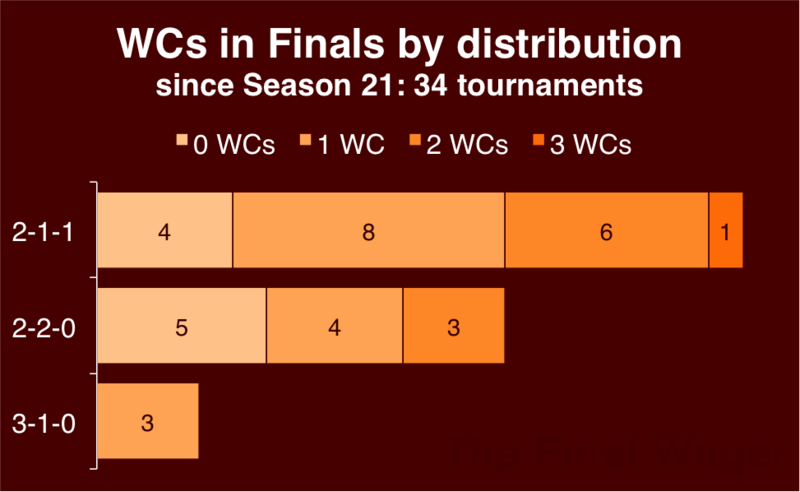 Perhaps even more surprising is the rate at which wild cards make the Finals. Even when spotted a 2-1 advantage against a lone quarterfinal winner, they bat only around 27%. When I ran these stats, I was surprised to see any games pitting three wild cards. I figured the contestant coordinators would even things out in most tournaments, sticking at least one wild card in each match. Turns out they do that over half of the time. This chart certainly caught my eye. When the wild cards are spread out, one has taken down the whole thing 7/19 times. When three are in a single game – which guarantees at least one wild card and one QF champ in the Finals – they’re 2/3. But look at that middle bar.  When the producers put three QF winners in one match and put two wild cards in each of the others, the wild cards are a dismal 1/12 as champions. It’s not as if they don’t have a chance.  Thrice have 2 wild cards met in the Finals after facing this distribution, but even then only once has one reigned supreme (Michael Falk in the S22 TOC). 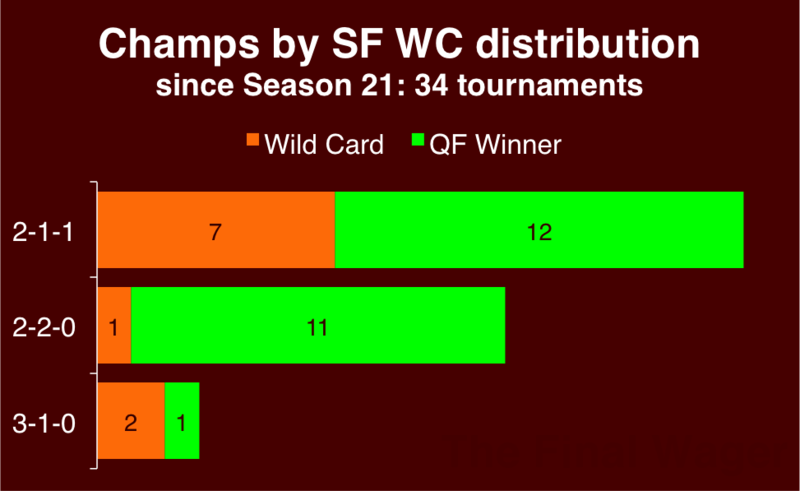 So we have some statistically significant evidence that wild cards are, on average, weaker than quarterfinal winners, particularly when it comes to advancing to the Finals. Why might this be? Steamrollers. Players who are strong in the first round, perhaps sewing up a victory before Final, are more likely to be strong in subsequent rounds. Confidence keeps rolling. Someone who’s already won a game knows the feeling, and has some built-in confidence heading into Week Two.  Some or all of the wild cards might feel like they’re lucky to be there – or even worse, that they don’t deserve their semifinal slot, and that might come through in their play. Back-door semifinalists. As I suggested last week, sometimes Final Jeopardy! is a crapshoot that rewards players who are lucky. I’m sure I’ll run the stats on all of these eventually, but for now: What do you think? I’d love to hear your thoughts in the comments below. This Teachers Tournament has a 2-1-1 format, which suggests the wild cards have a fighting shot. In case you’re interested in running the data yourself, here are summaries of the 34 tournaments used in this study. I think the steamroller effect may be the strongest here. 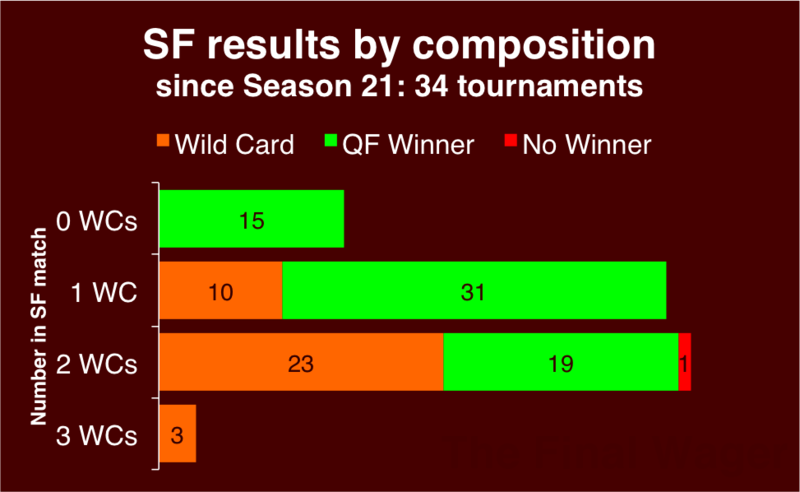 I’d be interested in seeing how far above average the pre-FJ QF scores of eventual tournament winners are, and whether they won their QF in a lock. I’d also be interested in knowing how often steamrollers crash out in the semis. Those are great ideas, Ben – I’ll certainly look into them next time I do a tournament-related post.